Over the last several years, we have come up with a pretty good system for just how to schedule our neurology clinics during each of the months that I am here with the residents. 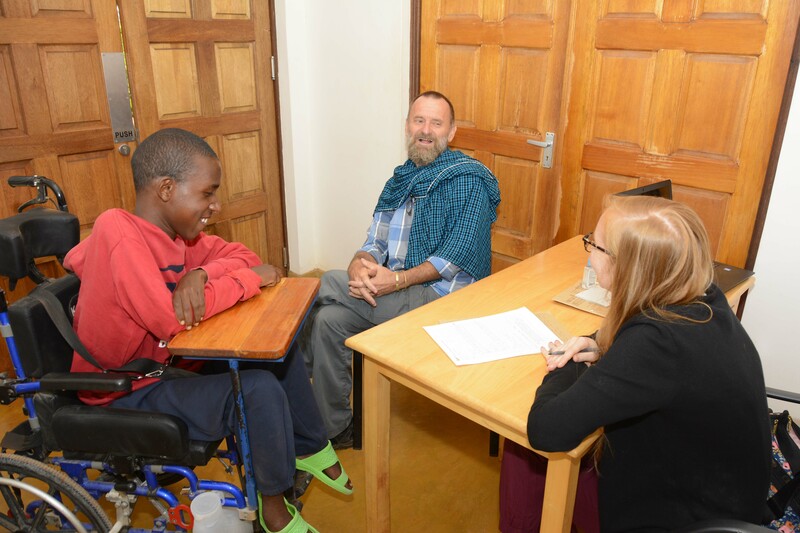 We knew that to build the program we would have to come on a recurring basis (hence the visit every six months) to develop a trusting relationship not only with the clinicians here, but also with the patients and families who come to see us and appreciate our care. Also, with the help of Paula Gremley back in 2011, we had developed the Neurology Mobile Clinics to bring access to our care to some of the more remote areas of the Karatu District. This model seemed to work very well as the clinics were very well attended and patients that wouldn’t normally come to FAME for medical care were introduced to us and could continue seeing us in the villages, but could also come to FAME if that was necessary. 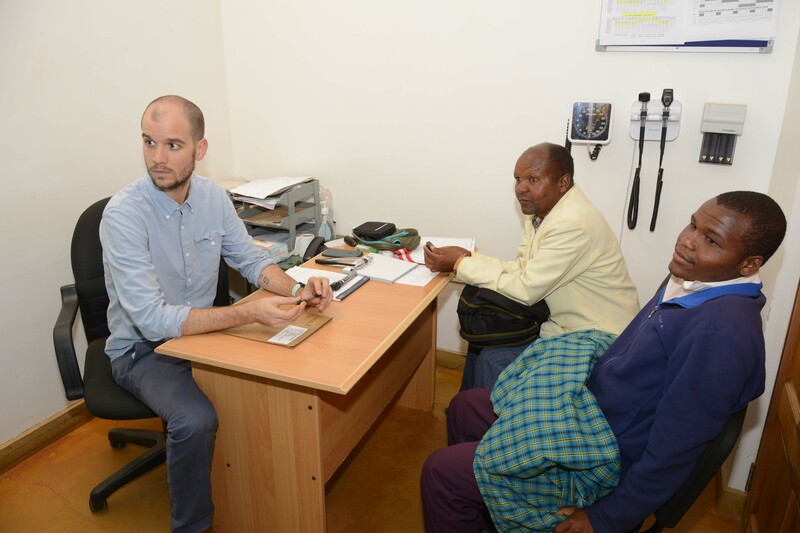 What began in 2010 with my teaching the clinicians here how to do a neurological examination and treat these patients when they just happened to come for care, has now evolved into a well-organized, month-long clinic in which we are seeing an around 300 patients each visit. Our visits are now comprised of an approximately week-long, clinic that we do here at FAME, a week of mobile clinics where we travel to more remote villages in the district, and then several days of clinic back at FAME where we can see follow up patients or patients who missed us the first time around. 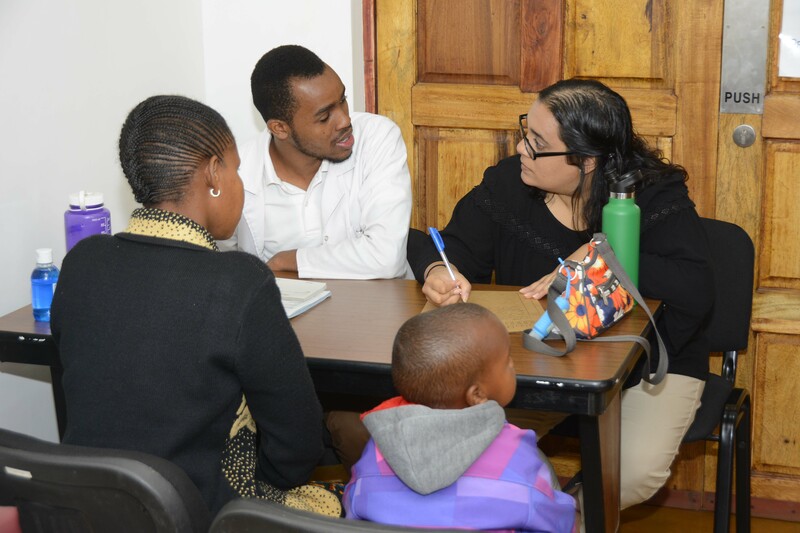 All of the clinics, including the mobile clinics in the villages, are well announced to the community by staff at FAME that includes Alex, our volunteer coordinator and neurology clinics coordinator, and Angel, our social worker. They travel throughout the district announcing our arrival typically a month in advance and inform potential patients of the types of disorders that we treat (despite this along with triaging when they come, we still see a fair amount of non-neurological patients that slip through). In addition, Angel has a list of patients who had come to FAME in the time between our visits with neurological disorders and it was felt that they should come back to see us. Often, I am contacted back home by email regarding these patients so that we can initiate care and then they will come back to see us when we get here. The first few days after our arrival are reserved for those patients Angel will call and are otherwise unannounced This allows everyone to get a good feel how things run here which is a bit different than back home. 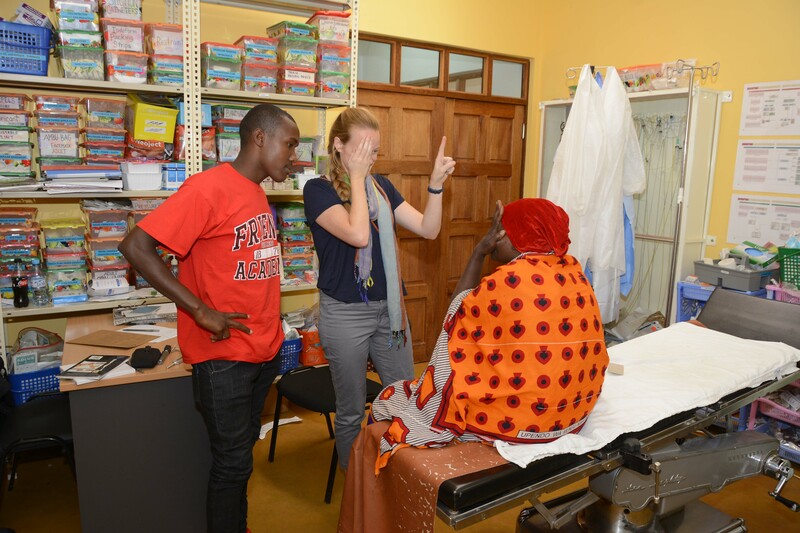 Every patient is seen with an interpreter (who also might be a clinician) and it sometimes requires two interpreters if the patient doesn’t speak Swahili which is not uncommon in some of the local Iraqw and Maasai population. The medications we have to use are limited and some are different than we have back home and many are in different doses than we have. The options in regard to testing is much different and the types of therapies we have at our disposal are much more limited than we have at home. But in the end, it is still mostly the same disorders that we are treating here as at home, though the differentials may vary quite a bit because of our location. The principles of medicine are still the same, of course, and it is all a matter of taking a good history, performing a good examination and developing your differential. For us, the neuroanatomy is just the same as it is at home, though we don’t have the MRI scans or even CT scans, that are often obtained before we see the patients, to fall back on when we are forming our differentials. It is actually medicine the way medicine was meant to be practiced and which is an all too uncommon event in today’s world. For some reason, I hadn’t remembered what our schedule was this trip and, for an equally odd reason, I hadn’t looked at the schedule on my computer since composing it to send to Alex well over a month ago. So, it is with this preface that we arrived to clinic on Friday morning expecting another unannounced, and therefore rather quiet, day. Well, it was an announced day and what we encountered outside the emergency ward (having been taken over this month to be our neurology clinic) was a bit of a mob scene with patients everywhere waiting for Angel to get them registered and then have their vitals taken so we could begin to see then. First, though, at morning report they presented a young gentleman having come in overnight with new onset left hemiplegia following left neck pain and having been found to be HIV positive which was a new diagnosis. The patient would also need to be seen in consultation by one of the residents so this needed to be done in addition to seeing all the patients that were now on our doorstep. 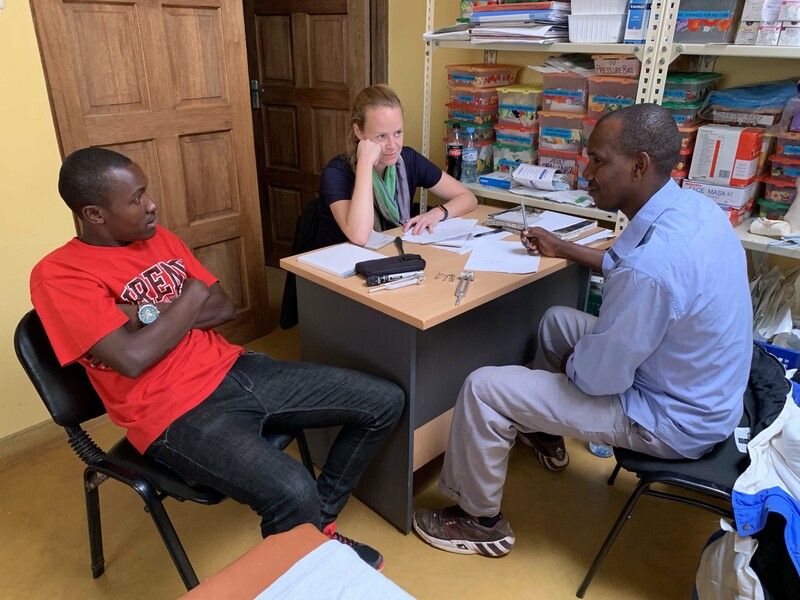 We had three exam “rooms” for patients to be seen in and I told Angel that we could start by registering thirty patients for the day as I knew that I would be asked to see other patients by the clinicians here throughout the day so we would inevitably see more than that. John went off to see the patient in the ward and Angel began the process of registering the patients we could see and having other people come back tomorrow. 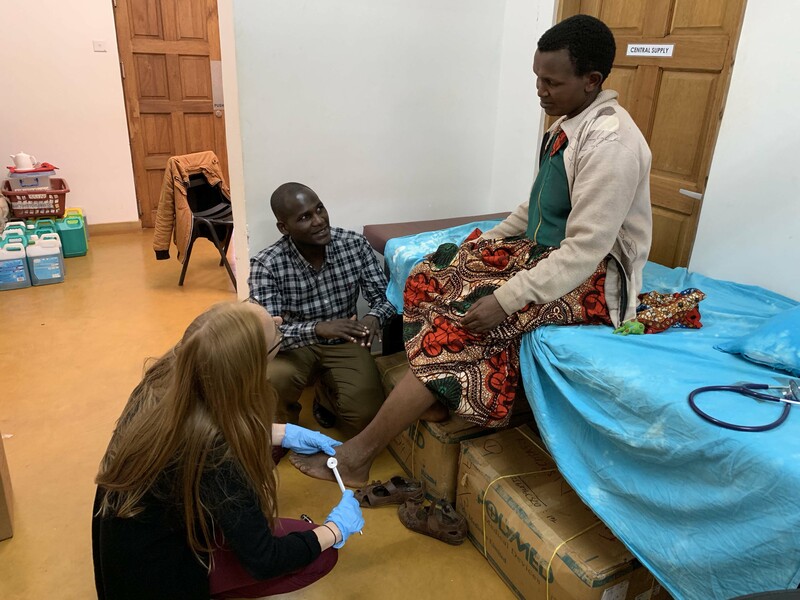 One group of women from Arusha has traveled to see us and weren’t in the group that we could see today, but there was just no way we could add them, so, with Susan’s help, they finally agreed to spend the night and we see them first thing in the morning. Later in the morning, the residents suggested setting up a fourth station to see patients which we put in the hallway adjacent to one of the other stations and the stations would share an examination table. 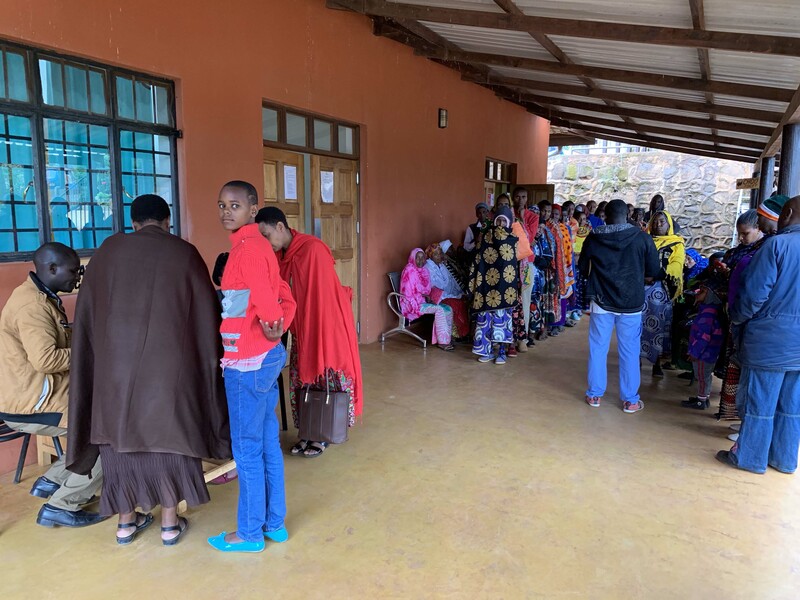 So, it was with this arrangement that we began to plod away seeing patients for our first “announced” clinic day of the season and quickly expanded the number of patients we would see too well above the thirty that we had originally intended. Lindsay also had to break off at the beginning to see a patient that Frank has asked us to see with back pain and was a local ex-pat here. He had come this morning to see us as more of an appointment which was perfectly reasonable I felt, but we chose to see him across the way in the general OPD so as not cause any issues with feeling that we were seeing him ahead of our other patients, as we were not, but this could be an obvious perception if one wasn’t aware of the reality and it was more appropriate in this situation to just prevent any sense of impropriety. Additionally, Ståle, who is the gentleman that runs a home in Mto wa Mbu and who I have known for several years, came this morning with his car full of neurologically impaired children. Somehow, he has been tasked with caring for a number of young men with muscular dystrophy, most who we diagnosed and have treated for several years, and brings all of them on the same day packed into his Land Rover with all of their wheelchairs tied to the top. Thankfully, he had gotten here early enough for us to make certain his kids would be seen given the difficulty he has getting everyone here. 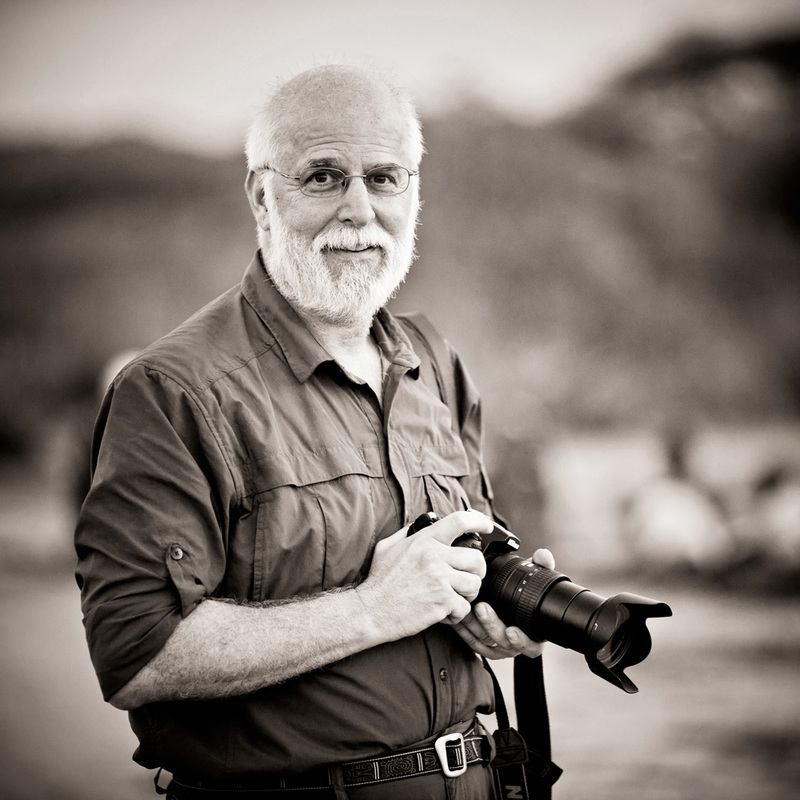 Ståle is a saint for the work he does with these children and for his dedication. Every resident who has met him and the children he cares for has been changed for the better seeing the dedication he has to these kids and the wonderful outlook these children have despite knowing the condition they have and what the future holds for them. He did inform me today that one child who we have probably cared for now for four or five years with what I believe was a paralytic illness, and probably poliomyelitis, that he had contracted well before he first saw us, died about a month ago from pulmonary complications as his spine had gradually become more and more flexed and he had no respiratory reserve. Living with Ståle, though, he had had a great outlook and a wonderful personality and had been well-cared for throughout his shortened life. So, it was on this background that we saw the remainder of Ståle’s kids, all mostly with Duchenne’s muscular dystrophy, though one with something else, and continued on with our incredibly busy day. Of course, it was immediately after adding our fourth station that would sit just as you enter the emergency ward, that we started see these boys, all in wheelchairs, and immediately ran into a traffic jam which was quite comical, but everyone just soaked it up to TIA, “this is Africa.” One of the older boys we have been seeing who had been quite depressed early, was no doing incredibly well and Ståle told us that he had come completely out of his shell and was not was now the life of the partly. It is really so incredibly touching seeing these boys and young men who are obviously suffering, but have chosen to make the most of it and have done such an amazing job. It is truly an honor to be taking care of them and I look forward to continuing to do this over the coming years. One of his young boys who had recently moved to his home just several months ago and had been assumed to have Duchenne’s muscular dystrophy was clearly different from the other children. I saw him with Amisha and we really had no history unfortunately as he couldn’t give us any and Ståle had no family members of his that he spoken with nor were they around. Sadly, many of the boys that he takes in have been abandoned by their families prior to him taking them in and, therefore, we have no history to go on. The boy was unable to walk, but had no psuedohypertrophy of his calves and the majority of his atrophy was in his shoulders and arms. He also had some mild wasting of his temporalis muscles and given this constellation of findings, it became clear to us that he had either fascio-scapulo-humeral or limb-girdle dystrophy, both of which have a tremendously better overall prognosis than Duchenne’s as they have a normal life span, albeit with significant disability. Still, that was some bit of good news that we were able to relay given the typical unfortunate news we have to deliver with the diagnosis of Duchenne’s. Finally, in the midst of our incredibly busy clinic, as had briefly stepped away for something, I came back to find that a patient had been brought in to see us on a stretcher and was promptly placed in the emergency room where Hannah was already seeing patients. Dr. Gabriel had mentioned to me previously that there was a patient he wanted us to see (and appropriately so) who had been in the hospital here in July with presumed encephalitis and wasn’t recovering. Unfortunately, after bringing the patient in, he promptly began with focal seizures that appeared to be epilepsia partialis continua and is something that can often be difficult to treat. According to his family, these had begun about a week prior and were essentially occurring on a regular basis. His original presentation was such that he was found unresponsive by his family at home and then had been brought into a local hospital where he remained unresponsive for about another 48 hours before being transferred to FAME. Here is was clear that he had an encephalitis and underwent an LP and was placed on antibiotics and acyclovir. He eventually had a CT scan showing numerous large early hypodensities in the brain and more specifically, the bilateral temporal lobes, the most common location for injuries that occur in herpes encephalitis. He had been treated with a 21-day course of oral acyclovir, but had never really woken up. He had also been placed on carbamazepine for his seizures as well, but at a relatively low dose considering the injuries to his brain and the propensity of to have seizures for the rest of his life. As he lay on the emergency room gurney, unresponsive with continuous jerking of his left face, arm and leg, his family stood by patiently awaiting our input into the situation and whether we had anything at all to offer their 28-year-old family member. There was no issue with handling the seizure part of the equation, but having our very own infectious disease specialist here was certainly a blessing as this is something that we would absolutely have consulted ID on at home and very much looked forward to their input. We have no confirmatory tests here such as a PCR on the spinal fluid, so the diagnosis would be based on the clinical features that were quite suspicious for HSV encephalitis with treatment that had been delayed by at least several days as he was found down at home with an unknown duration, been in an outside hospital with no specific treatment for at least two days and eventually transferred her and treatment was initiated quite quickly. Herpes simplex encephalitis is something that must be treated immediately upon consideration of the diagnosis as the virus rapidly multiplies and the damage it causes becomes more extensive and it is irreversible once it occurs. The mortality rate for HSV encephalitis can be very high even treated and the morbidity is great with chronic seizures and very common severe cognitive deficits. We had to tell the family that he would not recover any of his function and would almost unquestionable remain unresponsive if he did not succumb to some complication. His seizures, though, we could possibly improve by increasing his carbamazepine and, if that did not work, we could add phenobarbital later. EPC can be very difficult to treat at times and this nature of the disorder is most often related to the nature of the underlying insult that is causing it to occur. 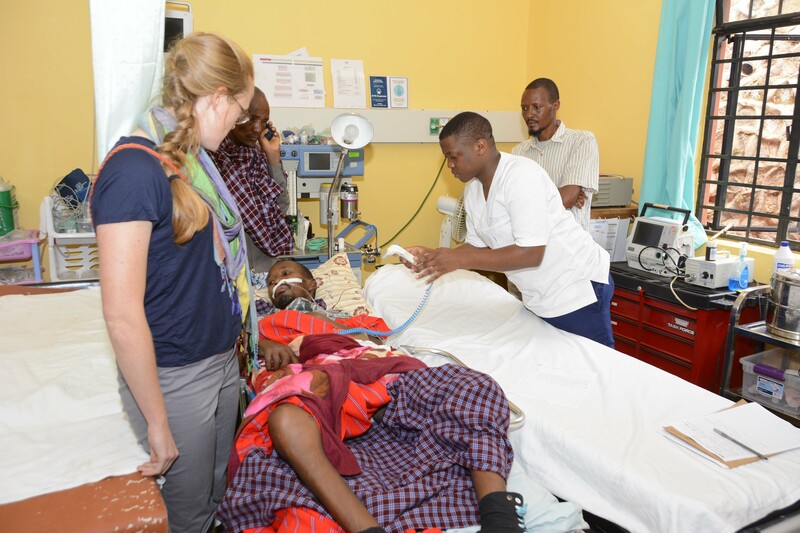 Our other patients were the typical mix of epilepsy, Parkinson’s disease, headache and back pain to name a few. Thankfully, we had no plans for the night as this turned out to be the largest, if not the largest, number of patients we had seen in a single day. We had seen approximately 41 outpatients for the day and when we add the inpatient that John had seem, it became 42 patients. That’s a large number of patients for us and clinic ran until about 6 pm, which wasn’t a problem for us, but we had to keep the staff late and, perhaps more importantly, our pharmacy closed and the last few patients were unable to fill their prescriptions and would have to come back the following morning after the pharmacy had opened. We all walked back to the house together that night, quite exhausted after such a big day, and very much looked forward to spending a very quiet night given the day that we’d all had.